CO-OPERATING for Cancer Care NorthWest, CCC(NW), has said it is "absolutely delighted and overjoyed" that the cross border, North West Cancer Centre at Altnagelvin Hospital began taking its first patients yesterday. 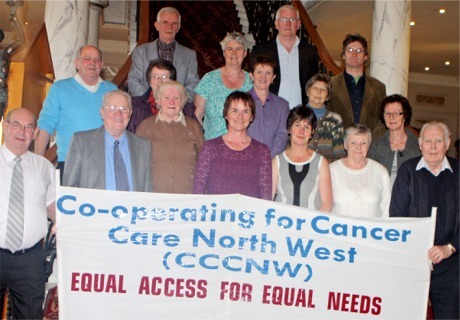 CCC(NW) members at the launch of plans for thr North West Cancer Centre at Altnagelvin Hospital in Derry. Finally, every person who played a role in enabling this centre to become a reality are part of this successful achievement and ought to be very proud of themselves. CCC(NW) would like to applaud all our fellow campaigners, followers and politicians from either side of the border who have also supported the development of this service. We would like to thank all members of the Radiotherapy Project Team, for their hard work, commitment and determination to ensure that the centre is opening today. We sincerely wish all those patients and their families who need treatment within the walls of this centre, peace and comfort."